Fujifilm registered the new Fujifilm FinePix XP140 at Bluetooth.com today according to Nokishita. The FinePix XP140 is their Water, Shock, Freeze, and Dust Proof Camera, which will be available soon. The current camera Fujifilm FinePix XP130 is currently on sale. 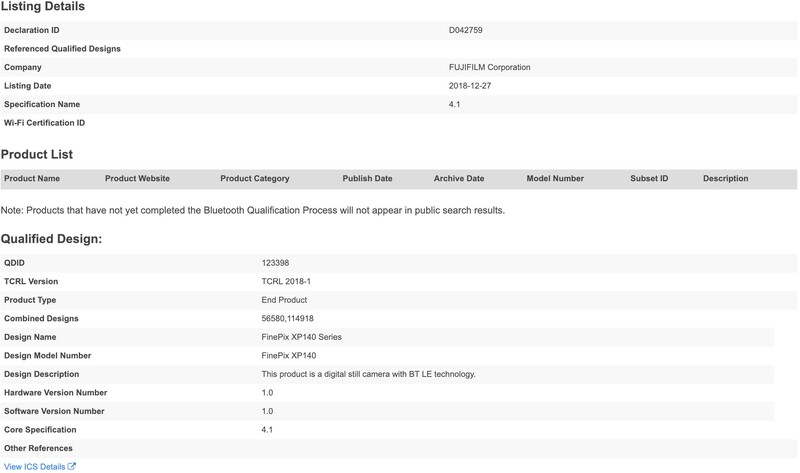 This entry was posted in Fuji patents and tagged FinePix XP140, Fuji Rumors, Fujifilm, Fujifilm FinePix XP140, Fujifilm Rumors, FujifilmRumors, Fujirumors. Bookmark the permalink. Trackbacks are closed, but you can post a comment.